Secure airside passage between Terminal 4 and TBIT opened 25 Feb 2016; T3 access is near Gate 41.
International arrivals security is open now; after dropping baggage off at the recheck facility proceed as if you were going to the curb. Turn right as you approach the exit to signage indicating the 40s gates. The baggage recheck facility and new south terminals bus port - replacing T-4 Gate 44 - are scheduled to open in the future. See page 1 for photos and guidance.. NOTE: LAX / LAWA allows passengers with a same day boarding pass access to any terminal. See Twitter link. One can now travel between AA Terminal 4 and Tom Bradley International Terminal (TBIT) via the new secure airside connector (two way airside access is here, as arriving international passengers can now clear Security after they process USCBP formalities), and to proceed airside between TBIT, the American Airlines and the legacy US Airways / Alaska terminals without leaving Security via airside. A shuttle bus from ground level near Gate 44 at T-4 and another bus port at T-5 connect to the Remote (American Eagle) terminal, with its own Club. Link to John Nguyen's article on Airline Reporter (with video of T-4 to TBIT walk). "Arguably, the biggest beneficiary to the connector is American Airlines, whose T4 is immediately adjacent to TBIT, and in fact has an agreement with the airport to operate several gates out of TBIT. The connector eliminates the need for passengers on Qantas flights to take a shuttle bus, as the walk from T4 to the TBIT gates should take around 5-10 minutes at a medium pace. In fact, it was measured at just under 4 minutes from Gate 41 to the entrance of the Oneworld First Class Lounge operated by Qantas." See Microwave's post #232 for photos and detailed information. I just used it departing from Los Angeles on Sunday, so it's definitely accessible from landside for local departures. Check in online or on your mobile so you have your BP to hand when you arrive, then have your driver deposit you on the arrivals level, at the far side of TBIT near the Shuttle Express stand. Go in the sliding doors which lead to the international arrivals area and turn immediately left: voila, the secret checkpoint. Once you clear security, take the lift up to level 5 and you can go either direction to T4 or TBIT; if you head toward the latter, you will be rather conveniently deposited directly at the Qantas First lounge entrance without having to fight any crowds. This thread is about the airside connection walkway between AA Terminal 4 and the Tom Bradley International Terminal / TBIT. For archived posts made prior to the opening, please see here. NOTE: LAX TBIT oneworld Premium / oneworld Business lounge and oneworld Qantas First lounge and access rules here: http://www.flyertalk.com/forum/ameri...er-thread.html. NOTE: Shuttle busses connecting Terminal 4 and TBIT are no longer offered, and would take considerably longer than the 4-5 minute walk airside. The opening date for the airside connector was originally Friday, 4 Dec 2015, March 2016 25 February 2016. American Airlines has preferential access to four gates at TBIT. Some domestic and international AA flights may depart from TBIT (gates 110-159). Some international AA flights can arrive at TBIT, and occasionally at the remote West 200 jetways to bus islands. Until the airside connector adds security processing for passengers arriving internationally, TBIT to Terminal 4 must be landside. TBIT is now connected airside to the south terminals 4, 6 and 8. TBIT is also connected to north, odd-numbered terminals. Secure Passenger Connector between T-4 and TBIT allowing screened passengers to transition between both buildings in both directions without the need for rescreening. (Sic) Now open. Upper Level World Way Plaza with open and landscaped areas and public seating will replace the open plaza currently on the Lower/ Arrivals Level between TBIT and T-4. Part of the new facility also will be built in this area. A temporary South Interline Baggage Transfer Facility to facilitate checked-bags between TBIT and Terminals 4 through 8 during construction of the new connector building. This $115 million project consists of the design and construction of a multi-use, multi-level facility providing a secure connection between Tom Bradley International Terminal (TBIT) to Terminal 4. Connecting the two terminals will allow passengers easier access to their destination for those needing to reach a connecting flight, with the added convenience of not having to recheck their baggage. This $115 million project consists of the design and construction of a multi-use, multi-level facility providing a secure connection between the Tom Bradley International Terminal (TBIT) and Terminal 4. The Terminal 4 Connector will make it easier for passengers to make connecting flights out of different terminals. The new CAL Green Certified space will include a Checked Baggage Inspection System (CBIS), South Matrix Interline Baggage Transfer facility and a five lane Passenger Security Screening Check Point (SSCP). A Passenger Bus Port is also being added for travelers transferring between Terminals 5 through 8 and a Public Plaza will be built for outdoor seating on the upper level. See Post #131 for renderings and timetable. Q. Where do I check in for an AA or Qantas flight? You can check in at AA Terminal 4 for AA - and there is NO LONGER a Qantas counter in Terminal 4 - you must check I at the Qantas counters in Tom Bradley International Terminal / TBIT. 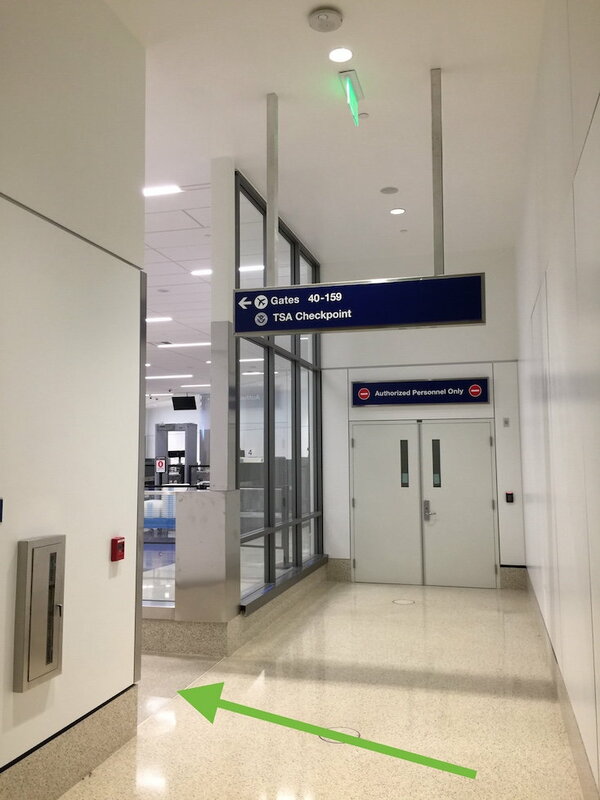 If checking in with AA but departing from TBIT, you can clear security in Terminal 4 and take the secure airside connector to the Tom Bradley International Terminal (TBIT). If departing on Legacy US or American Eagle flights, those departing from the 60s gates including 60A-J, you will find it more convenient to check in at Terminal 6. (For other airlines you may be connecting to, if you haven't been checked in previously you must check in at the TBIT (e.g. Air Fiji, Air Nui, airberlin, British Airways, Cathay Pacific, Iberia, etc.) or other terminal (e.g. Qatar departs Terminal 2). 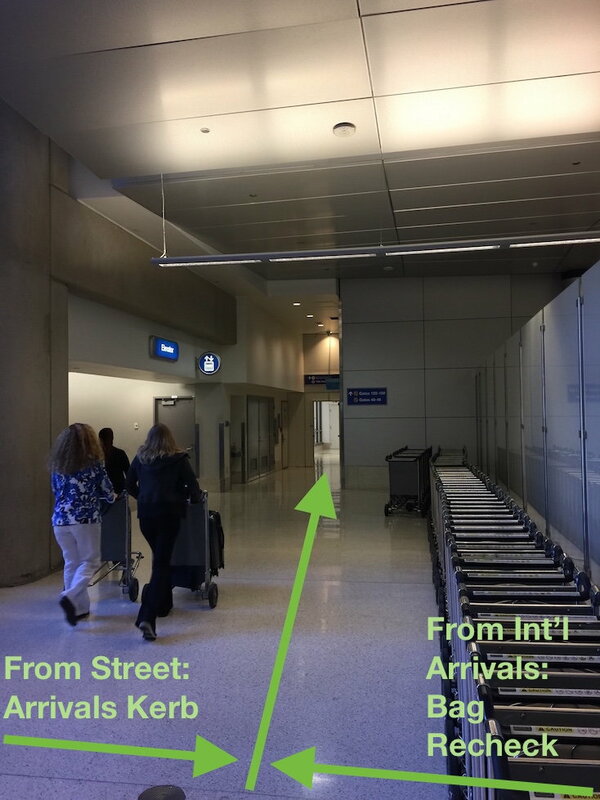 How/Where to get Short Connection Special Treatment at LAX TBIT? Access rules: (v. Feb 25, 2016) See here. Departing in First on AA to JFK on a 3 cabin A321T. Departing in First or Business on AA to JFK on a 3 cabin A321T. Looks like the Connector design has changed somewhat. The "Connector Walkway Roof" was due for completion end of November 2014 and "New Interline Baggage Carousel Operational" in early March. In addition to the SSCP, a bridge above the TBIT mezzanine level (shown below) will provide an airside passenger connection between TBIT and Terminal 4. This bridge will be constructed in conjunction with the SSCP south vertical access components; however, will not be available until the Terminal 4 Connector Project is complete. So no airside connection until everything is done in 2016 or so? No, the T4 connector is a separate project. The comment you are referring to is the opening date of SSCP walkway to the T4 connector. SSCP may open before T4 connector so the walkway will not be active until T4 connector is open, and vice versa. Basically, the SSCP currently under construction at TBIT will open straight into TBIT departure hall; or you can go up the walkway to the left and walk into the T4 connector. The idea is that if you clear security at TBIT, you can proceed to T4 without going into TBIT departure hall. It's a short cut that should save a few minutes of walk time. I initially thought that may be a possibility, but am thinking the text may relate only to the walkway above the mezzanine. The exterior part of the connector sits on the new luggage facility - I really cannot discern for sure. A four month delay to the date as per the link in post 71 would indeed mean 2016. I think the T4 connector can open for air side connection sometime after the bus port is open - so originally May 2015 but could be as late as September? The land side connection (i.e international arrival transfer to AA @ T4) won't be open until SSCP is ready so as early as September 2015 but as late as January 2016? The new TBIT is definitely a lot better than before. Better late than never, I suppose. Here are some pictures I took. The first picture shows the perspective one would see immediately after turning right after baggage recheck (assuming you're clearing immigration and customs at TBIT) -or- the perspective one would see entering the terminal having been dropped off at TBIT at the arrivals level kerb and entering the building at the far end near the Shuttle Express stand and turning left. I've aded a green arrow to show where one would be arriving from (kerb or bag recheck) and where to go. Once here, follow the green arrow left; also notice the overhead sign showing "Gates 40-159". In this next picture I've shot the TSA security area after I've cleared security, so now I'm facing back toward the way we came. I've added green arrows to show the passenger flow. 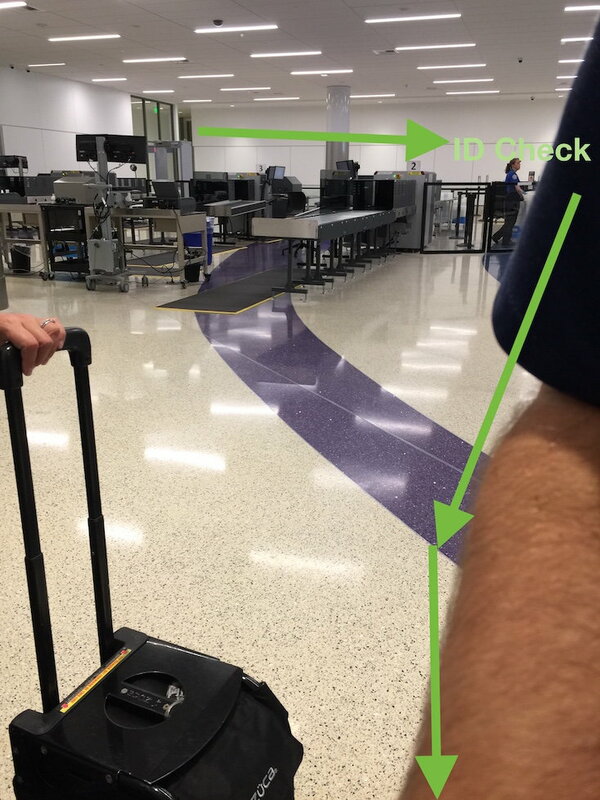 One would enter the security area from the corridor in the 2nd picture (you can see some of the security gear in that pic), pass along the back of the room through the tensa barriers to the ID check. From there, proceed through security and follow signs to the lift, up to level 5, where you can turn left to get to T4 and right to get to TBIT (immediately adjacent to the QF F lounge entrance). I didn't take pictures of this as by the time someone had got this far there would be signs showing where to go (and nowhere else really to get lost). Enjoy! For airside pedestrian traffic between Terminal 4 and TBIT, it's now open. Not open yet are the baggage processing facility and international arrivals security processing facility discussed in the wikipost. 8:30 - 10:30 T-4 to TBIT shuttle for departing international oneworld passengers. 15:30 shuttle bus for departing passengers when AA 108 is operated out of TBIT. 16:00 and after shuttles for TBIT departing Qantas flyers. IceTrojan states farther on the termination date for these shuttles has not been announced. Iwould percieve no need for the bus any more, even considering mobility impaired passengers. Agreed. I'm saying we don't know how those shuttles will be affected. Will they end today with the "soft opening"? Will they put up signage that's clear and useful? Will they end it on another day? The issue is to check and not get caught flat footed by the assumption the shuttles will be functioning - or not. It takes just under 4 minutes at a medium pace to get from Gate 41 to the entrance of the Oneworld/QF F lounge, which is right at the TBIT end of the connector. IMO there's no need for the shuttle bus anymore. Escalators + elevators at both ends, + 2 short moving walkways at the inclined areas. Also, G2 staff (the wheelchair people) were walking back and forth to familiarize themselves with it. Great news about the opening! The entire South side terminal complex is now connected to TBIT. Update: The video is now stabilized, and I added some annotations. I walked from Gate 41 to the F lounge in a little over 4 minutes, standing still on the escalator but walking on the people mover.